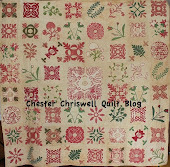 I decided to use the quick, fabric wasting method to make my Chester Criswell block this month. Since I have more fabric than time. First I printed 4 copies of the pattern, reversed two and taped them together to make a complete pattern. Then I traced the whole pattern onto freezer paper. I then ironed this to another piece of freezer paper to make it sturdier. So I could turn the edges. Since there were no connecting lines in the pattern I made sure to put some registration marks so I would be able to line the pieces up again once cut apart. After cutting the pattern out I ironed two pieces to one piece of fabric and two on another. I had previously marked the pattern on my background with a blue wash away marker and was careful to include the registration marks. Difficult to see in the picture but they are there. I then turned the edges with my starch and little iron. Placed them on the background and stitched. I have never done back basting but I think it would be a good method to use for this block. With back basting it could be done from one piece of fabric without all the waste. Nancy, great tutorial on how to do this! Thanks for sharing. Thanks for showing your method - looks wonderful! I will probably also be fabric wasteful when I make this block. I love seeing how everyone is making theirs. 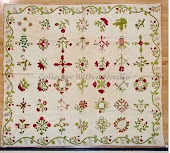 There are almost as many ways to make a block as there are quilters! Wonderful! I like your background fabric too. Thanks Nancy, I agree with the rest, it's helpful to see how everyone tackles a tricky block. 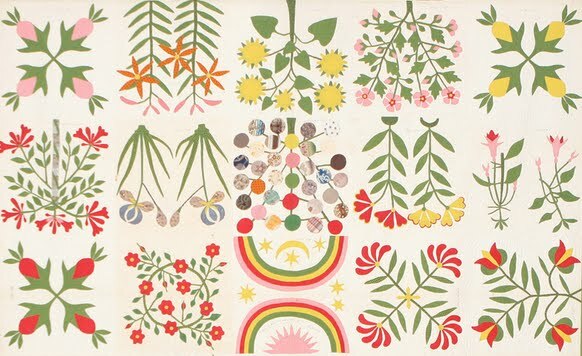 Who would guess that there are so many ways to applique?